Everlast has a significant portfolio and experience of working with asbestos cement based roofing products. Even to those outside of the roofing and building industry little needs to be said about the hazards associated with asbestos. It is therefore essential to be aware of statutory regulations placed on building owners, occupiers and property managers, with regards to asbestos in buildings. 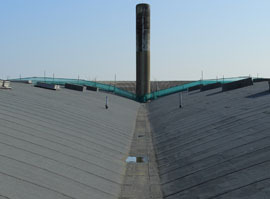 Chrysotile asbestos cement roofs are often found in industrial buildings and with growing concerns over asbestos, companies are hiring specialist organisations to remove the material safely and quickly. All of our roofers are fully trained on the requirements of working with and around non-licensed chrysotile asbestos. We also train our people to be able to identify the risks associated with licensed asbestos products such as amosite and crocidolite. We work with an alliance of licensed asbestos removal contractors to ensure any licensed work you require is dealt with professionally and safely, so you can be confident you have a fully qualified team on board. Everlast offers a complete service for the safe removal and treatment of Asbestos cement based roofing products. Our solutions and service delivery meet HSE Guidelines and offer a system approach that gives the Client confidence that the roofing works are installed to meet their own operational needs inclusive of individual Health and safety requirements. All of the above have different implications regarding costs and performance. This might help reduce the cost of essential asbestos remediation works. As part of the government’s urban regeneration scheme, under the Finance Act 2001, it is possible to claim 150% of the cost of asbestos remediation against your company's profits as tax relief. For example: if asbestos removal costs £10,000 a company can deduct £15,000 from their taxable income. This also means that if the company made a loss, then they could be eligible for a cash rebate. Please see Section 70 and schedule 22 of the Finance Act 2001 for more information or ask your company’s accountant or financial advisor for more information on how this might apply to you.